4th Horseman's ode to Korean-fusion food: The Memento Mori pizza, topped with beef bulgogi, kimchi, a gochujang tomato sauce, and bits of roasted pineapple. Photo by Brian Addison. Today is National Pizza Day, a time to indulge in our crispy, gooey, loaded with toppings, national obsession. 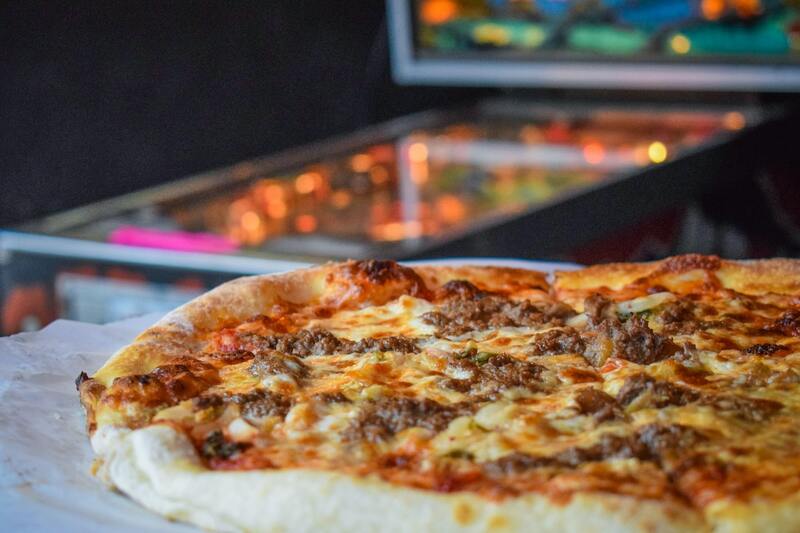 Whether it’s your cheat day or the fifth time you’ve had a slice for dinner this week, you’ll find lots of pizza spots in Long Beach for any occasion. Here are six suggestions. Welcome to the dark and gluttonous world of Downtown Long Beach’s 4th Horseman. Photo by Brian Addison. 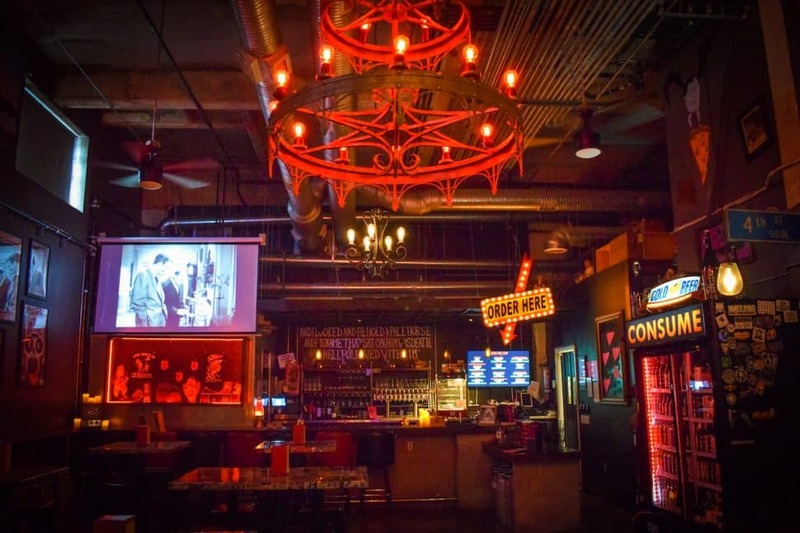 An ode to horror films and all things macabre, 4th Horseman apocalyptic pizza is the newest haunt to creep the streets of downtown. Sit down in the dark space adorned with art including shrunken heads, vintage monster posters and old television sets blasting static. All the pizzas have names to match the restaurant’s vibe, with “Death to Piggy”—classic meat lovers—“Pastrami Dearest”—a Reuben sandwich in pizza form—and “Memento Mori”—a Korean fusion masterpiece with beef bulgogi and kimchi. We also can’t forget the sprawling beer selection on tap, from quality local craft brewers to your standard Miller High Life, this place has the perfect beverage to pair with your pie. No diet left behind: Pizzanista! Want not, dear vegans, Pizzanista has you covered with plenty of vegan “meat” (pepperoni, sausage and bacon), veggie toppings and vegan Daiya cheese for you to devour your pizza guilt-free. Hand-tossed and never frozen, according to their website, Pizzanista’s New York-reminiscent thin crust is fresh, crispy and also available gluten-free. Play it safe with a classic Margherita slice or Sicilian square, or go nuts and take home a whole 18’ inch pie. But, be prepared to spend at least $21 for any whole pizza toting more than just a layer of cheese and sauce. It’s greasy, cheap and always good. For the past two decades, Deli News has been saving the pennies and stuffing the faces of broke students and on-a-budget families dining in East Long Beach. Located in the Los Altos Shopping center, just a four-minute car-ride from the Cal State Long Beach campus, its student clientele is arguably what keeps this hidden gem afloat. With massive portion sizes and prices so low you might wonder if the whole menu is a misprint, the restaurant boasts its ability to feed a family of four for under $25. The pizzas are baked in a standard range of sizes (small, medium, large and extra large) with the extra large able to serve four people—or three depending on your PPI (Personal Pizza Intake). While they do charge for extra toppings, they don’t skimp, and the mozzarella is always so gooey it can feel impossible to tear a slice away from its whole. 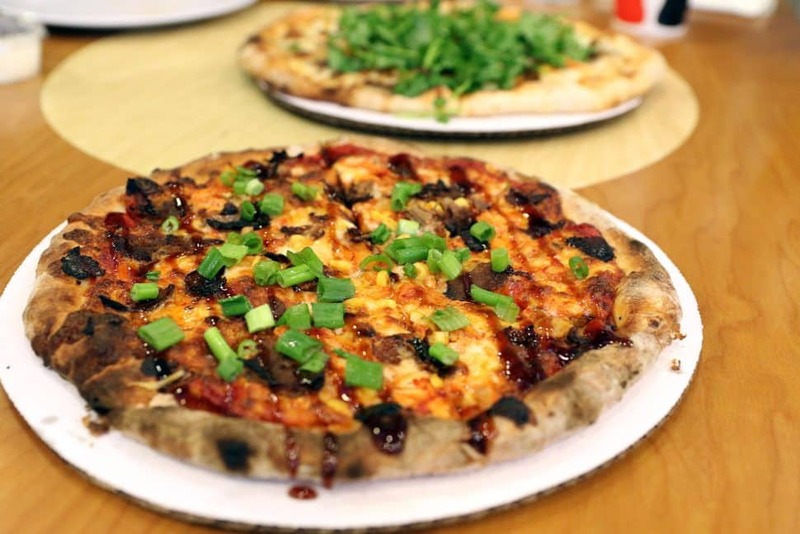 With pizzas ranging from Chinese roast duck to egg and Filipino longanisa to Korean bulgogi beef and kimchi, this walk-up shop will take you around the world with its fusion creations. The counter-service spot in Bixby Knolls incorporates the chef’s Cambodian heritage to create fresh creations starting at $7. Soft, thick crusted and stuffed to the core, 5,000 Pies may be the answer to your Chicago-style pie cravings. Each pizza and pie (savory or sweet) at this take-out only pizzeria is hand-crafted and made from scratch, so make sure to call ahead as each deep dish requires nearly an hour to make. Their menu, minimalist at heart, allows you to exercise your own creativity with a build-your-own, three-topping deep dish; $10 if it’s just for you, up to $24 if you’re sharing. From their perch atop the Pacific Coast Highway slope, Big E Pizza, the self-proclaimed “king of late night”, is the drunk-dial savior to the sloshed weekend house-party scene. With delivery promised until 3 a.m. on Friday and Saturday nights, consider your crusted indulgences covered. While it may not be the best pizza you’ve ever eaten, or the cheapest, it’s good. And available. And, if the booze reserves run dry, standard selections of bottled beer and wine can be delivered until 2 a.m.